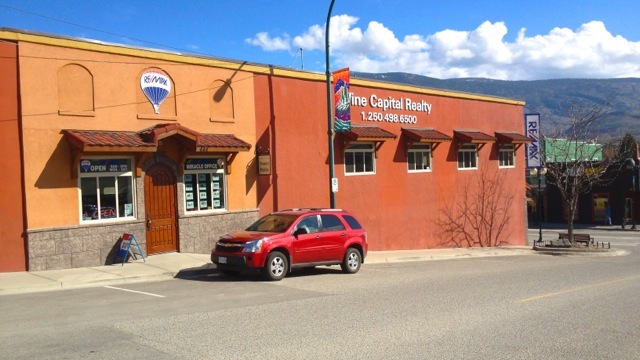 Re/Max Wine Capital Realty is located in Oliver BC. They are the Okanagan's Real Estate Specialists. To sell your home or help you in the home buying process, you'll experience an exemplary level of service. is conveniently located in the centre of downtown Oliver. RE/MAX brings its international market presence and cutting edge real estate marketing know-how to the South Okanagan. It is recognized as the leading real estate company in North America. Broker/Owners Mathew and Karen Lewis and their team of outstanding agents are proud to be a part of this respected organization and they look forward to servicing their wonderful community under the RE/MAX banner. Left to Right: Oliver RE/MAX Realtors Maria MacCarthy, Sonia Mason, Matt Lewis and Owen Paxton setting up the Volunteer Aid Stations at the Annual Oliver 10KM Run in 2018.